Today we have something fun: a guest story written by Dennis Brooks about the three Carrera 2.7 MFI Targas originally delivered to Australia in 1975. The three Targas were recently reunited at the 2016 Porsche Rennsport Motor Racing Festival in Australia. In 1975 Porsche was at the crossroads. The widespread recession of 1973 had passed but the first oil crisis of late 1973 and early 1974 was to have a greater lasting effect on all car makers worldwide.Porsche’s survival in these times was no doubt helped by income from their outside client design consultancy in Weissach. Looking ahead, Dr Fuhrmann’s 3 litre Turbo was readying for production in March 1975 and would springboard Porsche into a new era. 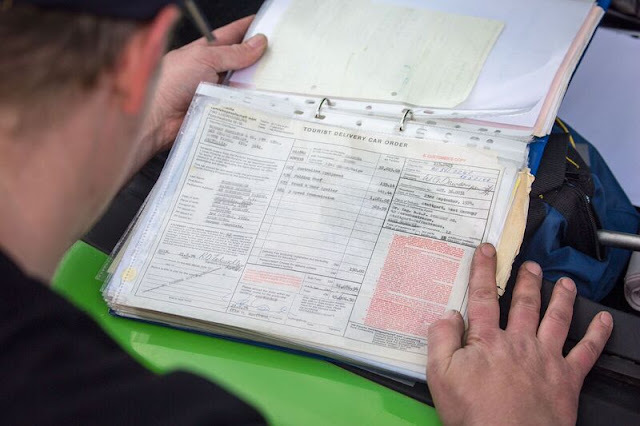 For Porsche’s biggest market, the American safety and emission regulations were starting to make their presence felt with the impact bumper regulations starting in 1974 and more severe emissions requirements from 1975. In line with many other car makers, Porsche took the step of increasing motor capacity to compensate the negative effects of these regulations. Porsche had already taken the first step with the introduction of the emissions friendly 2.4 E series in late 1971. The second step was to enlarge this long stroke motor to 2.7 litres in the G series of 1974 coupled with the new Bosch CIS injection which made Porsche motors more in step with emission requirements without losing their performance standards. Late 1972 saw the introduction of the iconic Carrera RS which combined the 2.7 litre motor with the Bosch mechanical injection system. The RS was a limited production series and was never intended for sale to America as the motor in its state of tune would never be able to pass the American emissions tests. This however was little concern to the Euro, British and Australian buyers as the mechanically injected Type 83 motor was integrated into their 1974 Porsche G series lineup as the top model Carrera – along with a Targa version - with the plain 911 and the 911 S being the others. These two had the recently introduced CIS injection system and all wore the new impact bumpers bodywork. Into this background the last of the Carrera 2.7 MFI series was introduced as the H programme in September 1974. A whaletail with a chin spoiler had superseded the previous ducktail but the H series was essentially the same as its predecessor. Carrera sales in Australia were good considering the size of the market here, the prevailing world economic conditions and the German Dmark movements. In 1973 there were 8 RS coupes sold at $17,700. In 1974 18 coupes and 7 targas were sold at $20,000 / $21,000. In 1975 14 coupes and 3 targas sold for $25,000 / $26,000. The 1975 price increases were mainly caused by the Dmark regaining its pre oil crisis values and an unwelcome increase in import duty here of 25% during the year. 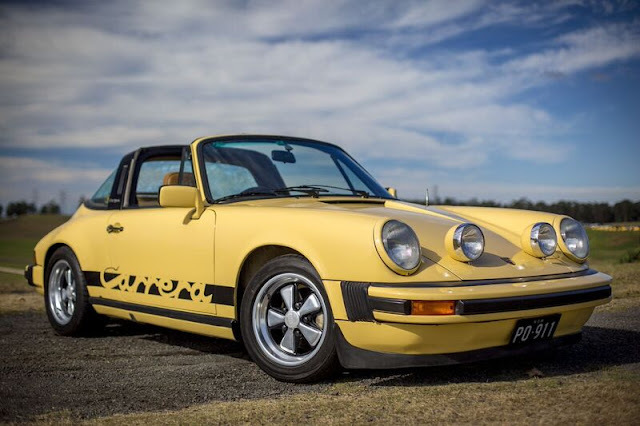 This almost made the RS look like a bargain …..
As the most expensive in the range, the 1975 Carrera Targa model sales were the most affected. Little wonder then that all three were ordered as tourist deliveries. All 3 came with the mandatory 5 speed transmission and C23 Australian equipment consisting of right hand drive, rhd headlight lenses, all glass tinted except for the windscreen and a drivers door mirror. The first – 911 561 0019 – was ordered in Guards red with cinnamon leatherette interior.Seats were the optional Recaro sports seats with shetland centres. The standard steel hard top was ordered in preference to the optional folding top.Other options were front & rear spoilers and 7” & 8” Fuchs wheels. This is a one owner car and belongs to Kevin Jarman in Brisbane. Kevin took delivery at Stuttgart in September 1974 and while living in London, did numerous trips to Europe. The car arrived in Australia in January 1976 and Kevin joined Porsche Club Victoria that year. 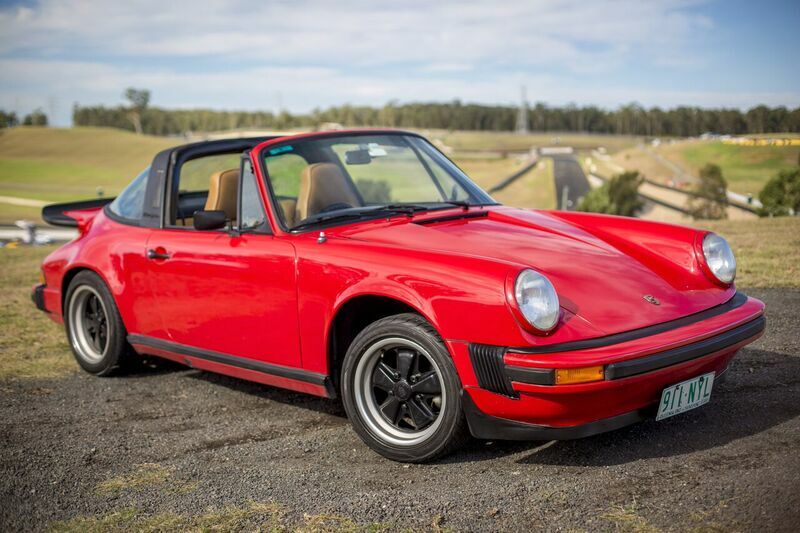 In this car, Kevin was Porsche Club Victoria club champion in 1978 and the Porsche Clubs Nationals Motorkhana champion five times in the early 1980s. The second - 911 561 0033 - was a Melbourne order in Sahara Beige with a full cinnamon leather interior. The only other option was a Blaupunkt Frankfurt radio. It had the standard steel hard top and standard 6” & 7” Fuchs wheels with no spoilers. The current owner is David Withers in Sydney and it has been a multi owner car over the years. The first owner was Paul Clark of Melbourne and was delivered in November 1975. Unknown when it came to Sydney but the first time I saw it was the early 1980s and belonged to Mike Orlainsky and was Arrow blue. In the late 1980s it was Copper Bronze and was returned to Sahara Beige by Ian Murray who sold it to me in August 1991. I owned this car until September 2004. 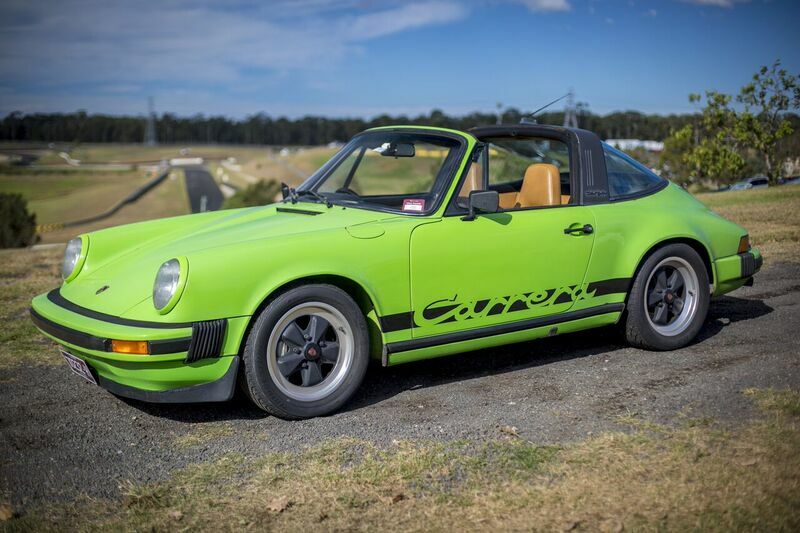 The third – 911 561 0040 – was a Perth order in Lime Green with cinnamon leatherette seats and tweed centres. Options were front & rear spoilers and the folding top with the standard 6” and 7” Fuchs wheels. Current owner is Kane Hearn in Melbourne and it has had only four documented owners. The original owner was Rainer Tscheuschler who took delivery in Stuttgart in October 1974 and added a Blaupunkt Goslar radio while he was in Germany. Rainer then worked abroad and returned to Australia via Japan and advertised the car in Unique Cars asking $39,900 in August 1997. It was found in Adelaide recently after eight years dormant with only 45,000 km registered and as such is the most original of the three. All three remain in remarkably standard trim despite now being over forty years old. 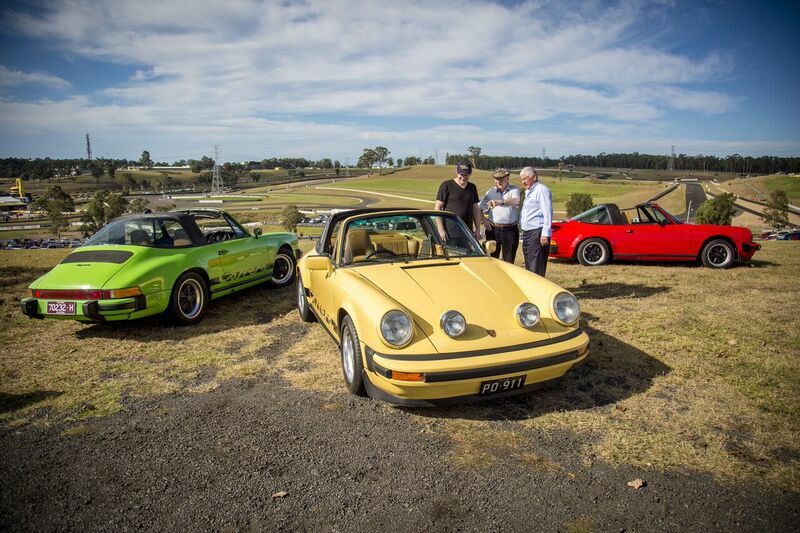 Those who were at the recent Rennsport at Eastern Creek would have seen these three Targas together in the Show and Shine area on the Sunday morning. Sharp eyed observers would have noticed the low profile 50/55 series tyres on all car . These would have replaced the standard 185/70 and 215/60 Dunlop Super Sport SP57s worn from new. These lower profile tyres such as Pirelli P7s were approved by Porsche as replacement use on the 1975 Carrera 2.7s and the new Turbo in conjunction with a corrected 300 kph speedometer (Christophorus 116 April 1975). The steel hardtops on Kevin’s 0019 and David’s 0033 were a little known standard fitting as the optional folding top proved much more popular. These were offered only in 1974/1975. Needless to say, they are a greatly prized collectors piece today. I had one with my car 0033 and they are very heavy. To say the least, it is very unusual to have a display forty plus years later of the total year’s production of the one Porsche model. It is a credit to the successive owners that they have considered the cars significant enough to maintain them well over them years. 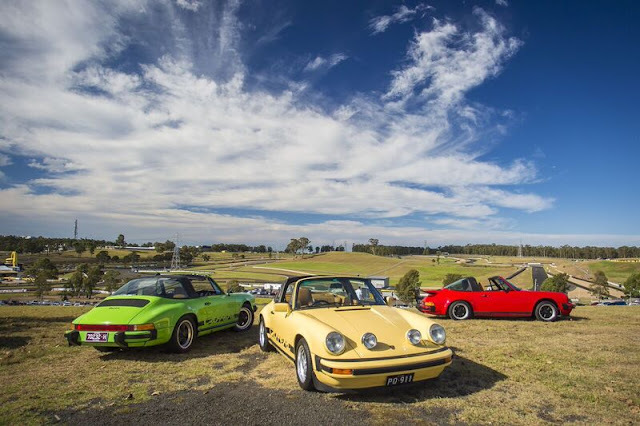 Thanks to the owners – David Withers of Sydney – Kevin Jarman for bringing his car from Brisbane – and Kane Hearn for bringing his car from Melbourne – true Porsche Club spirit!